The THS Academic Teams compete in a local organization of eleven area high schools, with one Knowledge Bowl hosted per year at each participating school. Competition begins in August and runs through April or early May. Each Knowledge Bowl features two competitions, the "A" and the "B" teams. Each five-member team answers 60 written questions and 60 oral questions. The questions are random, but cover a wide range of academic topics including all content areas. Last year, out of eleven Knowledge Bowls, the Academic Eagles "A" team won eight of them, and the "B" team won four. This year, we hope to do even better. 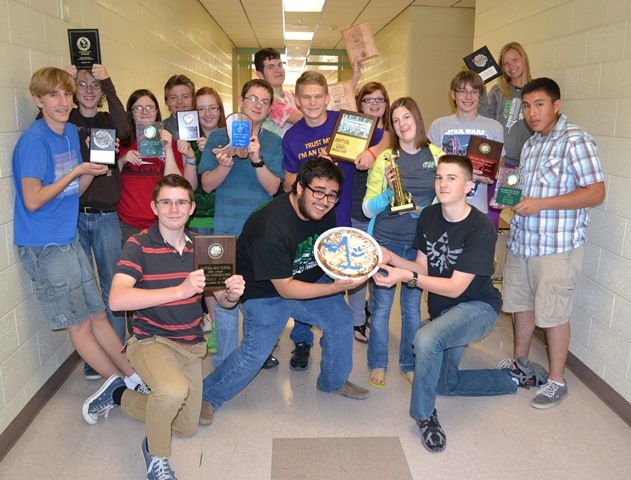 The photo above is the Academic Team displaying all the plaques and trophies garnered in the 2013-2014 school year. 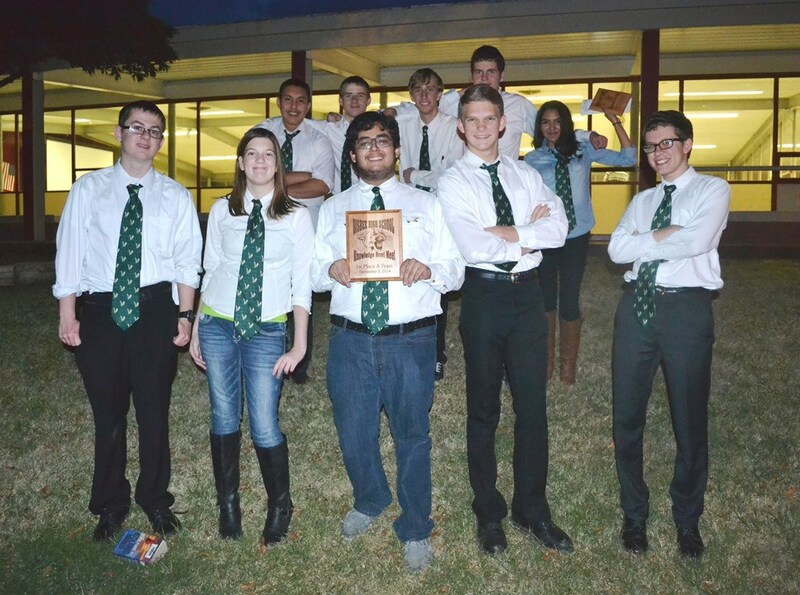 The Academic Eagles ended their year as strong as ever, sweeping the Tombstone Knowledge Bowl on Wednesday, April 22 in the last Knowledge Bowl of a long but very successful year. 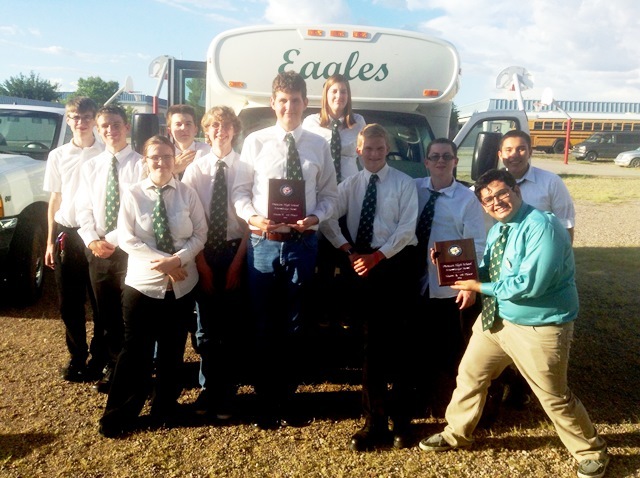 This year, the “A” team won ten meets and placed second in one, while the “B” team won eight meets and placed second in three. 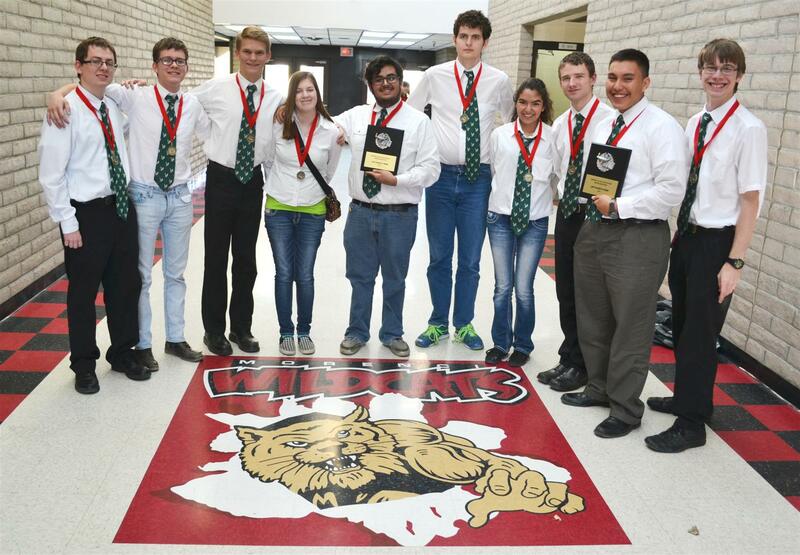 The combined A and B teams swept a total of seven of eleven Knowledge Bowls. Standing, left-to-right: Robert Tillman (sr), Travis Skinner (jr), Anthony Bejarano (sr), Eric Allred (sr), Abraham Smith (soph), Kyle Clark (jr), and Chase DeSpain (sr). Sitting, left-to-right: Lindsey Griffin (sr), Buddy Romero (jr). The Academic Eagles traveled to Elfrida on April 25 and achieved their sixth sweep of the year at the Valley Union Knowledge Bowl. The "A" team won by ten points with a final score of 72, and the "B" team won by fifteen points with a final score of 61. With only one Knowledge Bowl remaining, the Academic Eagles have insured that they will have swept over half of the meets this school year. B Team: Dawson Allen, Stuart Lines, Buddy Romero, Eric Allred, Chase DeSpain, and Abraham Smith. A Team: Lindsey Griffin, Shane Skinner, Kyle Clark, McKay Keith, and Robert Tillman. 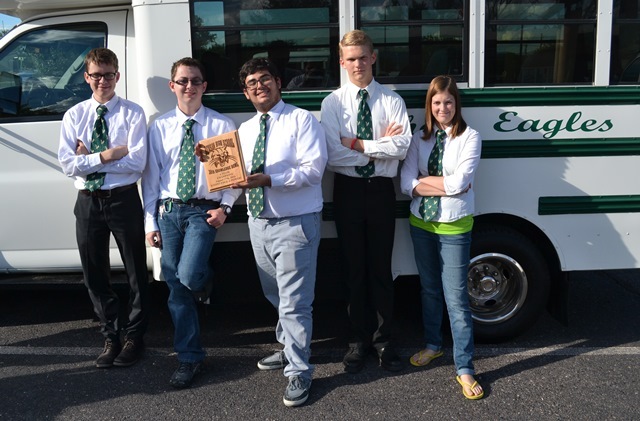 For the fifth time this school year, the Academic Eagles swept a Knowledge Bowl, winning first place in both A and B competitions at the Morenci Knowledge Bowl on March 4. Not only did they sweep the meet, but they did it in dominating style, both teams winning by 20 points. In fact, not only did the B team outscore all B teams, but all A teams as well (except of course for Thatcher A). The Eagles were rewarded for their efforts with individual first-place medallions as well as first place trophy plaques, and Coach Hoeft was awarded two personal trophies for the two first-place finishes. Left to right: (A team) Robert Tillman, McKay Keith, Shane Skinner, Lindsey Griffin, and Anthony Bejarano, (B team) Abraham Smith, Buddy Romero, Chase DeSpain, Kyle Clark, and Eric Allred. On February 18, Thatcher High School hosted the 2015 Thatcher Knowledge Bowl, with spicy Chinese chicken and rice provided by the THS Culinary Arts classes, and with the national anthem provided--solo and a capella--by Academic Eagle ace Shane Skinner. The A team got back on its winning track, winning the A competition, and the B team took second place, edged out by one point. Front row, left to right: Lindsey Griffin, Anthony Bejarano, and Buddy Romero. Back row, left to right: Robert Tillman, Shane Skinner, Garrett Younger, Stuart Lines, Abraham Smith, Chase DeSpain, and Kyle Clark. 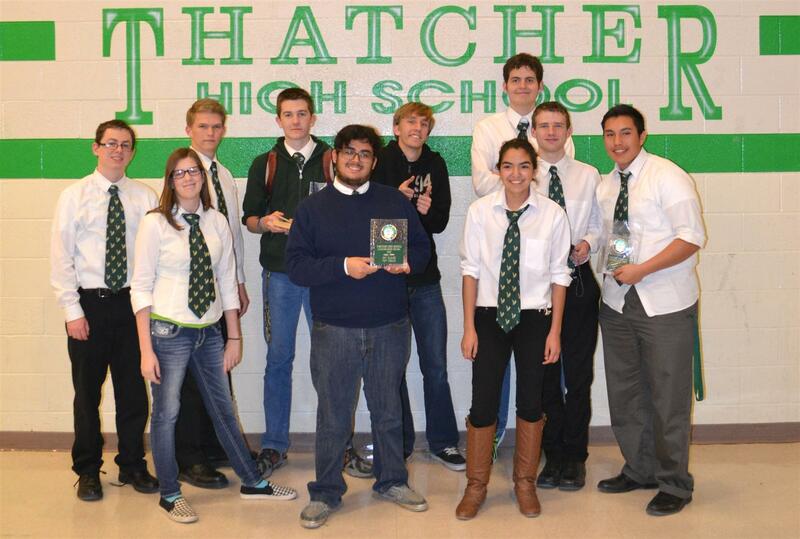 For the first time in the 2014-2015 school year, the Thatcher A team failed to take first place, finishing second at the Willcox Knowledge Bowl, January 21. But the B team got back in their groove and took first place honors. Front row, left to right: B team members Kyle Clark, Abraham Smith, Buddy Romero, Garrett Younger, and Chase DeSpain. Back row, left to right: A team members Lindsey Griffin, Anthony Bejarano, McKay Keith, Robert Tillman, and Shane Skinner. With a new semester, the Academic Eagles got back on track and running at full steam, as they swept the Saint David Knowledge Bowl on January 7. This meet had some suspense, as both "A" and "B" teams were in second place after the written round of questions. After the first round of oral questions, the "A" team was tied for first, and the "B" team was leading the B competition. After the final round, the "A" team had won by 6 points, and the "B" team by 5. (Left to Right) B team: Chase DeSpain, Buddy Romero, Garrett Younger, Eric Allred, and Abraham Smith. A team: Anthony Bejarano, McKay Keith, Kyle Clark, Lindsey Griffin, and Robert Tillman. 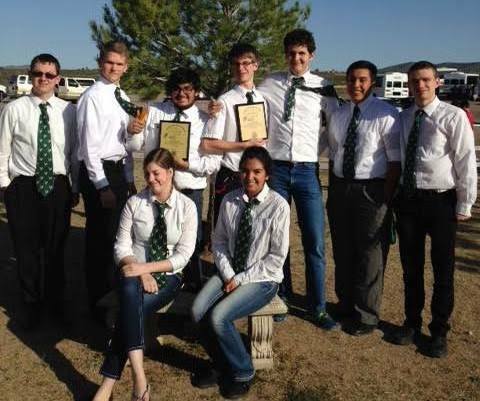 The Academic Eagles competed in the Bisbee Knowledge Bowl on December 5, and came away with a win and a place. The "A" team took the "A" competition handily, but the "B" team came in second, ending the sweep streak at three. Bisbee was the final meet of the first semester. In five Knowlege Bowls, the "A" team garnered five wins, and the "B" team won three meets and placed second in two. Top row, left to right: "B" team Kyle Clark, Chase DeSpain, Stuart Lines, Abraham Smith, and Buddy Romero. Front row, left to right: "A" team Robert Tillman, Lindsey Griffin, Anthony Bejarano, Shane Skinner, and McKay Keith. 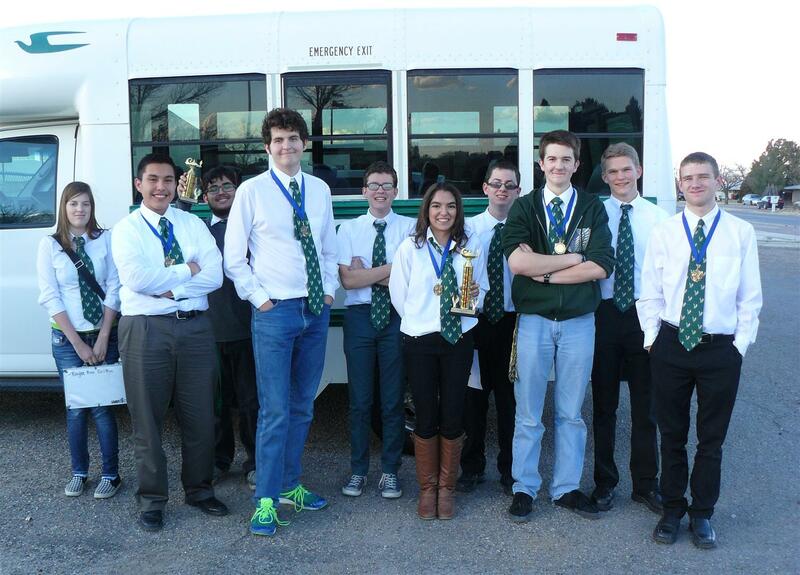 The Academic Team swept the Safford Knowledge Bowl Wednesday, November 5, winning both A and B competitions. The A team won by 20 points, and the B team won by one point, defeating Willcox B in double overtime. Back row: Mr. Hoeft (coach), Abraham Smith (B), Anthony Bejarano (A), Shane Skinner (A), Garrett Younger (B), Lindsey Griffin (A). Front row: Robert Tillman (A), Chase DeSpain (B), McKay Keith (A), Kyle Clark (B), Eric Allred (B). This is the third sweep in a row for the Academic Eagles. 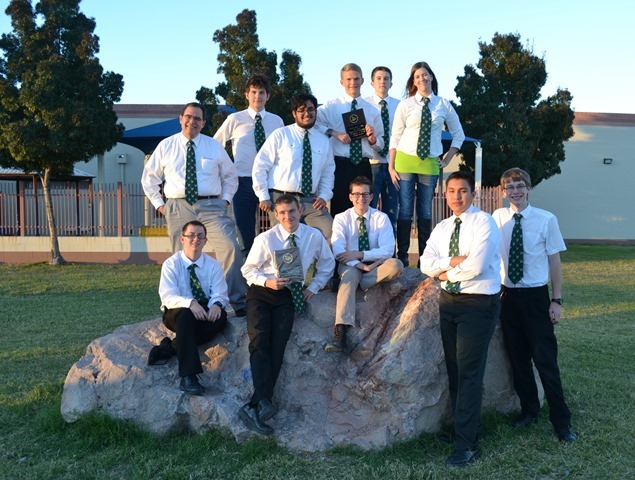 The Thatcher High Academic Team won their third meet in a row on October 8 when the “A” team placed first in the Pima Knowledge Bowl, finishing 25 points ahead of the second place team. Thatcher’s “B” team also won the “B” competition, winning by 11 points. “B” team members included Eric Allred, Abraham Smith, Chase DeSpain, Kyle Clark, and Garrett Younger. “A” team members included McKay Keith, Lindsey Griffin, Shane Skinner, Robert Tillman, and Anthony Bejarano. The Thatcher High Academic team swept the Duncan Knowledge Bowl on September 24, winning both the “A” and the “B” competitions. Team members include from left to right (“B” Team) Eric Allred, Chase DeSpain, Emily Cooper, Garrett Younger, Michael Allred, Abraham Smith, and (“A” Team) Lindsey Griffin, Shane Skinner, Robert Tillman, Anthony Bejarano, Kyle Clark. The distinction of garnering the first win of the year for any Thatcher High School competitive team goes to the Academic Eagles, who traveled to Benson on Wednesday, August 27, and won the first Knowledge Bowl of this school year. In the “B” competition, the Thatcher “B” team finished in second place. Since last year’s outstanding “A” team (which won 8 of 11 meets and came in second in 2 others) are all returnees—we lost no players due to graduation—we expect to do well this year. The above photo also showcases this year’s new look: white shirt & green tie embroidered with eagles.